Mai Iskander’s portrait of an embattled Egyptian recycling community had its debut at SXSW in 2009. It had an extensive run on the festival circuit, including IDFA, Dubai, Lone Star, Ashland, and Nashville, among others, picking up numerous awards. It went on to win at the IDA Awards, and was nominated for a DGA Award and shortlisted for the Best Feature Documentary Oscar. After its broadcast, the doc will be available for a limited time on WORLD’s website. Historically, Cairo has not had a conventional sanitation system. The city’s garbage instead has been tended to by the minority Zaballeen, a community of Coptic Christians subsisting on the trash they collect and recycle, creating an efficient system that has lasted for generations. 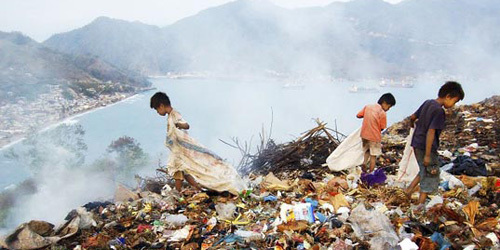 In 2003, all that changes as Cairo privatizes these traditional services to a multinational sanitation service that recycles only a fraction of the garbage they collect, disposing of the rest in growing landfills, and, in the process, threatening the future of the Zaballeen and their only real income stream. Iskander follows three teenage Zaballeen over several years as they contend with the changes to their trade and deal with the transition to adulthood. Well shot, and impressively balancing multiple subjects – including the fascinating garbage village the community has constructed for themselves on the outskirts of the city – the film offers insight about a unique group of people, their ingenuity to take others’ trash and turn it into treasure, and the local consequences of modernization and globalization.